Do we really need double the firefighters? The reborn Climate Council has recently put out a new report on the projected impact of climate change on bushfires. Most of the content is backed up by sound research and pretty decent science, but some of the media coverage is focussing on a supposed doubling in the need for fire-fighters by 2030. By 2030, it has been estimated that the number of professional firefighters will need to approximately double (compared to 2010) to keep pace with increased population, asset value, and fire danger weather. This was sourced from a 2013 report titled Firefighters and climate change: The human resources dimension of adapting to climate change prepared by the National Institute for Economic and Industry Research for the United Firefighters Union (I’m going to leave aside the obvious question of bias here and stick to the content). It focusses on full-time firefighters of which there are about 11,500 in Australia in addition to the FTE of 1700 part-time firefighters and 220,000 volunteer firefighters. It’s these 11,500* who are counted as professional firefighters in the report. I’m going to focus on the projections for NSW for time constraints. First, population and asset growth. Here’s the projections of firefighter numbers that the report says would be required to maintain existing levels of firefighter cover of population and assets in NSW. This is an annual growth rate of 2.1-2.2% to 2020 and 1.2-1.3% between 2020 and 2030. But the population of NSW is not growing this fast. Over the next 20 years the ABS estimates that population growth will average somewhere between 0.9% and 1.3%. So that leaves the rest of the projected growth due to increases in asset value. But does asset value make sense as a basis for estimating fire cover? Not really – assets are property and a property will increase in value over time (due to inflation, rising replacement costs, increasing land value etc.) even though the property itself (and thus the number of firefighters needed to put it out if it’s on fire) remains unchanged. Population growth should be able to account for the increasing physical units of stuff (houses, businesses, vehicles etc.) that firefighters provide protection to. Maybe, though there’s other drivers? The first thing we notice is that fires make up a relatively small proportion of the overall activity of Fire and Rescue NSW (and this is similar to other urban fire organisations across the country). The second thing we note is that the total number of incidents as a proportion of population is unchanged over the last 15 years. That is – population alone can explain any increase in the activity of Fire and Rescue NSW. One thing that might be harder to see on the graph is that the number of fire incidents is actually going down. This is particularly the case with structure fires which have decreased by 32% over the last 15 years, per 100,000 population. Other fires have also dropped, by 42% – though the reduction in fire response has been offset by increases in non-fire rescue (57%) and Hazmat incidents** (20%). The increase in non-fire rescues is likely due to expansion in the land rescue areas that FRNSW is responsible for. The decline in structure fires makes sense – we’re building safer buildings (code compliant, better electricals, fire safety measures etc.) and we’re also behaving safer (mostly because fewer people are smoking in bed). Landscape fires (bush and grass fires) make up about a third of the ‘Other Fires’ category, but I don’t have enough data to break this category down across a decent time series to identify any trends. This produces a much more sensible growth rate. Now let’s turn to climate change. Again here are the NIEIR projections for NSW, this time with added rows for a Low (H2) and High(H3) climate change scenario. The NIEIR methodology hinges on a correlation they found between the number of Landscape fires in Victoria as set out in the 2012 Report on Government Services and the number of total fire ban days (both partial and statewide) declared in Victoria in any one fire season as enumerated in the CFA Annual Reports. By my count that’s a measly 5 data points. 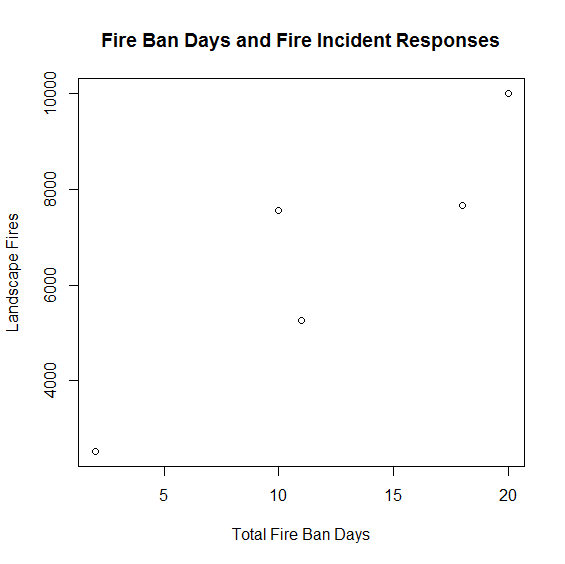 Here’s the plot of the number of total fire ban days versus the number of landscape fires in Victoria. There’s a reasonably strong positive relationship there (correlation coefficient ~0.9) – but it’s only 5 data points. NIEIR could really have done better than that. The response could be substantially more noisy than appears or even non-linear. They’ve also assumed that this relationship would hold everywhere. NIEIR then uses an excellent report prepared in 2007 by the Bushfire CRC, CSIRO and the BoM for the Climate Institute which examined, amongst other things the expected change in days with FFDI>50 (on which Total Fire Bans are generally declared) under a variety of climate change scenarios. Now here the outline of the methodology begins to get a bit shaky. They seem to have applied some sort of modifier to take into account fewer bushfires in urban and arid areas (which is sensible) and matched similar sites in western and northern Australia with those in the Lucas paper (which is not sensible – the climate regimes are unlikely to change in similar ways) to produce area estimates of the increase in firefighters due to both climate change and population/asset growth. Now here comes the kicker – best as I can figure out (by reverse engineering the math) NIEIR has assumed that the increase would apply to all incident types responded to by professional fire fighters, not just the landscape fires that make up about 5-10% of all incidents responded to by full-time firefighters. Even a doubling in the number of Extreme fire danger days, which is likely in some but not all areas, would only increase the overall taskload of NSW full-time firefighters by 4-6%. This is actually within the annual variation in incident numbers in NSW, suggesting that on this crude measure it would be possible for additional response to climate change to be handled within population adjusted resourcing. On the other hand the resource requirements of the volunteer fire services (where a much larger propotion of the taskload is made up of bushfires) could be more severely impacted. Unfortunately I don’t think that these type of analyses really provide much information for emergency managers to plan future resource requirements in response to climate change. The impact of climate change on emergency services will be most keenly felt in extreme events – where you’re more interested in surge capacity and where part-time firefighters and volunteers play a much larger role. A scenario approach to modelling resource requirements during these extremes would provide much more insight into what we really do need for the greater amount of extreme weather in the future. In the meantime it sadly seems that the Climate Council lacks the resources to adequately check its sources, especially when they come from the gray literature. Here’s hoping that they can encourage some work to get the real answers on human resource requirements for extreme fires under climate change. * The report also discusses some of the problems in counting how many full-time firefighters there are in Australia, it uses a figure of 12,041 which is calculated from Census responses. I’ve taken the figure from the Productivity Commission’s Report on Government Services – so this is an approximate figure. ** I’m not very confident about this figure – FRNSW have changed their way of categorising hazmat incidents over the years, so a small change here may have been offset by a small change in one of the other incident categories – probably other. I’ve applied all the usual statistical tests and these changes are significant – just as there is no significant change to the Other incidents category or the Total incidents overall. *** Here I’ve used the number of full-time firefighters contained in the FRNSW Annual Report. In all my courses here in Pavia we’ve been getting into the alphabet soup of international disaster management. One thing that’s got me a little confused are all the international reports on disasters. So I’ve compiled a list of all the regular reports brought out in the international space on disasters and data and trends in their impact and response. One thing about most of these reports (particularly for a data geek like me) is that they’re underpinned by massive amounts of data on disasters, their impact and response – including time series. Global Assessment of Risk – This report is published by the United Nations Office for Disaster Risk Reduction (UNISDR) every two years. World Disasters Report – Published annually by the International Federation of Red Cross and Red Cresent Societies (IFRC). Global Risks – Published annually by the World Economic Forum (WEF). Annual Disaster Statistical Review – Published by the Centre for Research on the Epidemiology of Disasters (CRED), this data in this annual report is used in many other international reporting. Sigma Natural Catastrophes and Man-Made Disasters – Swiss Re publishes this report annually as a special issue of it’s Sigma magazine. Global Humanitarian Assistance Report – Published annually by Development Initiatives. One of my favourite pastimes is getting hung up over terminology used in disaster management – different jargon means different things in different places. This can be problematic. For example I recall one instance where some relative newcomers to emergency management in Australia were promoting the establishment of Local Resilience Forums in Australia. Thing is that Australia already has them – for example in NSW they’re called Local Emergency Management Committees and in Queensland Local Disaster Management Groups. Even simple words like risk and resilience can mean different things to different professionals – and that’s without even taking into account community understanding of various words. accident Used in English from the late 1300s it is from 1100s old French from the Latin accidentem/accidere “to happen or fall out” from ad– and cadere “fall”. alert Used since the 1590s from the French alerte from the Italian all’erta “to the height” from erta “lookout, high tower” past participle of ergere “raise up” from the Latin erigere “raise”. catastrophe Although in use in English since the 1530s it originally meant a “reversal of what is expected” acquiring its present meaning around 1748. The word is from the Latin catastropha from the Greek katastrophe, from katastrephein literally meaning a down-turn. control The present use as “to direct or dominate” is from the mid 1400s. From early 1300s “to check or regulate” from the Anglo-French contreroller “exert authority” from the medieval Latin contrarotulus “a counter or register” from Latin contra– (meaning against) and rotulus (meaning wheel). coordination Circa 1600 meaning “orderly combination” from the French coordination from late Latin coordinationem from Latin coordinare “to arrange or set in order” from com– (meaning “together”) and ordinatio “arrangement” from ordo “order”. Present meaning of “harmonious action” used since 1855.
disaster From the 1590s derived from middle French désastre which is from the Italian disastro meaning “ill-starred”. emergency First used around the 1630s it is derived from the Latin emergens, present participle of emergere meaning “to rise up or bring forth”. hazard First used around 1300 (though the modern meaning only evolved around the 1540s) from the 12th century old French hazard which may be from the Spanish azar “an unfortunate card or throw at dice”. The Spanish word is possibly from the Arabic words az-zahr “the die” or yasara “he played dice”. mitigation From mid 1300s from the Latin mitigationem/mitigare “soften, make tender” from mitis “gentle, soft” and agere “do or make”. rescue Used since around 1300 from the old French rescorre ”protect or keep safe” from re– and escourre “to cast off” which is from the Latin excutere “to shake off”. resilience Used since the 1620s it’s from the Latin resiliens/resilire meaning “to rebound/recoil” which is a combination or re– and salire “to jump/leap” (and interestingly where the word salient comes from). risk First recorded in English in 1728 it entered into usage in the 1660s from the French word risque which itself comes from the Italian risco (which is now rischio) from riscare meaning “run into danger”. vulnerability Vulnerable was first used around 1600 from the late Latin vulnerabilis which means “wounding”. warning Since the late 1300s from old French monition from Latin monitionem “warning or admonition” from monere “to warn”. A few weeks ago a small earthquake shook areas of Sydney around Campbelltown. The tremor prompted an article in The Fifth Estate where experts warned that most people vastly underestimate the risks of an earthquake in Australia. Prior to this I had been researching the risk of an earthquake in Sydney as part of an assignment. I found that whilst the likelihood of a Sydney earthquake are small, the consequences could be great. Although far from tectonic boundaries Australia is more seismically active than the interiors of other continental plates. Although these intra-plate earthquakes are less common than those that occur along plate boundaries, earthquakes with magnitude 7 or more can happen occasionally. Elsewhere in the world earthquakes of this magnitude, when they strike near major population centres, can cause significant damage and loss of life. There are numerous faults throughout the urban area of Sydney. Although most of these show little sign of recent activity recurrence intervals on faults in Australia can measure in the order of tens to hundreds of thousands of years. At the foot of the Blue Mountains lies the 28 km long Kurrajong Fault Complex. This has been the subject of quite a bit of research as it could produce large earthquakes of magnitude 7 or greater. The likelihood of a large earthquake on this fault is highly uncertain, though it is probably smaller than 1 in 100,000 per year. Sydney has a very low density. Of its 1.5 million dwellings 55% are separate houses and only 10% are in apartment buildings of 4 or more storeys. Some construction in the city survives from the early 1800s. Houses built prior to the 1930s are likely to be of poorer unreinforced masonry construction and more prone to structural damage or collapse in the event of an earthquake. Houses built since the 1980s should include modern seismic resistant elements based on the mapped hazard for Sydney at the time. Asbestos was a common construction material from 1945 to 1980 and could be disturbed by even light earthquake damage. Sydney Airport handles 35.6 million passengers and 470,000 tonnes of cargo per year. In addition to the Airport a large amount of heavy industry is clustered around Botany Bay. This includes Port Botany, the Kurnell Refinery and Desalination Plant. All these assets are on unconsolidated or reclaimed land (notably the runways of Sydney airport) more likely to experience strong earthquake shaking. 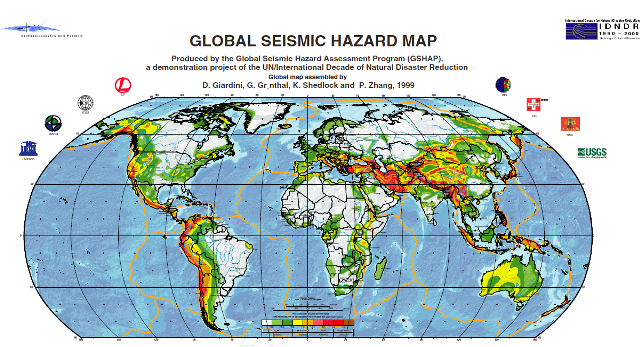 Sydney is located in a moderate earthquake hazard zone for the Australian continent. A peak ground acceleration of 0.05g has an annual exceedance probability of 1 in 500. The likelihood of of different peak ground accelerations being exceeded in the Sydney area is given in the table below. Earthquake shaking can be much worse in soft, sandy or watery soils – indeed it’s on these soils that damage is often most severe. The amplification of ground acceleration can be up to a facor of three. Although most of Sydney sits on relatively firm ground there are many areas on softer soils. The most important of these is Botany Basin, which extends north from Botany Bay almost as far as the Sydney CBD. The Botany Basin is a low-lying swampy area with a water table close to the surface. 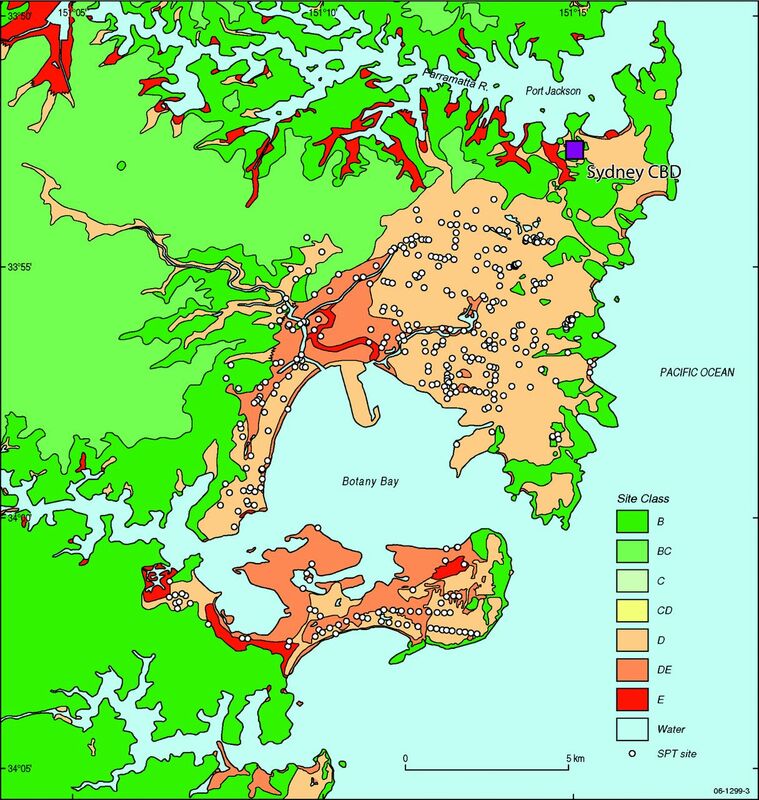 There are other smaller areas of unconsolidated sediments and fill, particularly along the foreshore of Sydney Harbour. These areas are likely to experience greater ground shaking in an earthquake than older areas which sit on consolidated rock. Slight damage and cracking in old buildings. Unsecured parapets, brick gables, unreinforced chimneys and tiles may fall. Heavy damage to old poorly constructed buildings, some collapse. Some damage to reinforced masonry buildings. Houses not secured to foundations may move. Many old buildings destroyed. Damage to reinforced masonry buildings some with partial collapse. Some damage to new structures. Houses shifted off foundations. Brick veneers fall. An earthquake on the Kurrajong fault complex could potentially produce even stronger shaking but is less likely. Although these earthquakes are rare emergency planning should not be discounted. Emergency planning for flood and tsunami in NSW considers events this rare and rarer. The combination of unconsolidated sediments and a high water table in the Botany Basin means that it may be susceptible to liquefaction. No investigations of this potential have been undertaken. 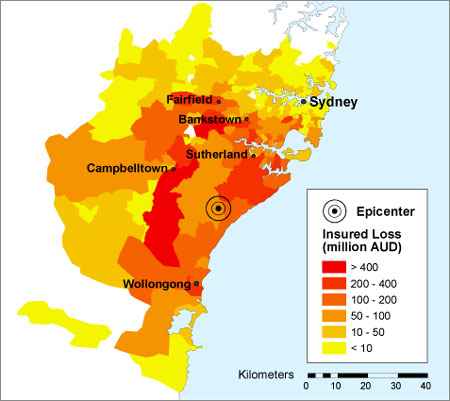 Other insurance risk modellers have prepared scenarios for an earthquake in the Sydney Basin. The one shown, estimates a loss of $11.3 billion for an earthquake of similar size to the Newcastle quake occurring 40 km south of Sydney. A significant hazard is the collapse of unreinforced masonry awnings in older commercial districts. This was extensive in both the 1989 Newcastle and 2011 Christchurch earthquakes and led to fatalities. These awnings are prevalent in many commercial areas throughout Sydney. Shaking amplified by local ground conditions and the possibility of liquefaction pose a potential hazard to the large industry around Botany Bay. Possible secondary impacts on travel and freight shipped through Sydney Airport and Port Botany could have flow-on economic effects to otherwise unaffected businesses. Damage to chemical plants or the Kurnell Oil refinery could lead to leaks, posing a risk to the surrounding population and having environmental impacts. Despite ongoing work in the Sydney Basin on earthquake hazards there is still substantial gaps in knowledge of the risk. Further research is required to address these knowledge gaps. The seismology of possible earthquake producing faults is still not well understood. Further research on these sites would help define the probability of an earthquake occurring. Assessment of liquefaction potential in the Botany Basin and other similar areas should also be undertaken. Priority should be given to the areas that host key infrastructure, such as Sydney Airport. A better understanding of the risk could help motivate governments to undertake mitigation and preparedness measures and prioritise areas for assessment. Retrofitting of individual homes is likely to be expensive and not cost effective, however attention should be given to emergency infrastructure such as hospitals, important public buildings like schools and important heritage assets. City of Sydney Council has conducted seismic retrofitting of some of its town halls. Special assessment should be made of masonry awnings in older commercial districts, particularly in areas where the ground conditions may lead to strong shaking. These proved to be particularly prone to collapse in the Newcastle earthquake. Key industrial and aviation assets surrounding Botany Bay should be engaged to undertake detailed seismic risk assessments including addressing liquefaction. Retrofitting should be considered where indicated by these risk assessments. These facilities should also audit their business continuity and emergency plans to ensure minimal disruption to operations in the event of an earthquake. Assessment of the seismic safety of bridges on Sydney’s extensive road and rail network should also be conducted. The geology and urban geography of Sydney could create specific challenges for an earthquake response in Sydney. The low density of Sydney, potential for widespread shaking and areas likely to experience higher intensities due to local ground conditions will create widespread low-moderate damage with pockets of heavier damage. The low likelihood of an earthquake and lack of lived experience also pose challenges to community education and engagement. New South Wales may wish to develop a State Earthquake Emergency Sub-Plan similar to that used in Victoria. Alternatively Supporting Plans for key functions that may also be required in other disasters could be developed. Key functions that will need to be addressed include Damage Assessment, Search and Rescue and Debris Management. Other elements of an earthquake response are already provided for in other emergency plans, however these should be reviewed to ensure that they would function appropriately in an earthquake emergency. Damage assessment is required during the immediate response for activities like search and rescue and for the longer term recovery to determine whether buildings are safe to re-inhabit. Use of new technologies could be used for rapid damage assessment. Creating social media and other technological solutions solely for earthquake is unlikely to be feasible, but the capacity to cope with reports of earthquake damage could be incorporated into other tools developed for hazards such as hailstorms. Prioritising areas for longer term assessment could also be challenging, as will sourcing enough qualified engineers to conduct assessments. Rules of thumb for initial checks by unqualified personnel may need to be developed. This could identify buildings that need further inspection. Although a substantial portion of Fire and Rescue NSW and the NSW State Emergency Service have search and rescue capabilities, including the rescue of people from collapsed and damaged structures there exists no plan for a large scale dispersed search and rescue operation. Coordination and communication between the different rescue services will be critical to ensure that the worst affected areas receive the resources they need, yet are not overwhelmed with emergency services personnel. Some areas will generate large amounts of debris as a result of destroyed structures and those needing to be demolished. Existing landfill sites are not likely to be adequate for the possibly large debris loads. This debris may also contain hazardous materials including asbestos. Careful management and disposal of this debris will be required to ensure that emergency service and waste management personnel and the broader community are not exposed. 1Local Magnitude, also known as Richter Magnitude. 2Annual Exceedance Probability: A measure of the chance per year of an event of that level or higher occurring. 3Probable Maximum Loss: A measure of the maximum loss in an insurance portfolio for a single event over a particular time period. Lateline: Fire expert, Professor David Bowman, discusses the latest bushfire emergency. Lateline (in fact the whole ABC) is doing some rather excellent coverage. Check it out. State of Emergency – What powers does it add? For the second time in 18 months NSW is under a State of Emergency due to a natural disaster. You can read the wording of the declaration here. From memory, before the flooding in 2012 there have only been two declarations of a State of Emergency in NSW under the current legislation. 1998 – After the Longford Gas explosion in Victoria to cut off supplies in NSW border areas that were supplied from Victoria. 1991 – During a Blue Green Algae outbreak in the Darling River to put the Public Works Department in charge of the government response. A State of Emergency is declared under the State Emergency and Rescue Management Act to give emergency services extraordinary powers to combat an emergency situation. These powers are usually more extensive than those available to the emergency services under their own acts (in this case the Rural Fires Act). I thought it might be interesting to do a play by play comparison of the powers under each act. This is necessarily a simplification, if you’re interested or need to use this stuff you need to read each Act, their Regulations or even get legal advice. A few quick notes. Not all RFS Members are Officers for the purposes of the Act. I’m not sure which rank confers these powers or whether they’re delegated in another fashion, but if anyone knows I’d appreciate it. An Emergency Services Officer for the purposes of the SERM Act include RFS members of or above the position of Deputy Captain. In my opinion this is one of the most important provisions of the State of Emergency powers – Michael Eburn covers it in his excellent post on the State of Emergency declaration here. The RFS does not have any power to evacuate people for their safety, so if they believe it is necessary They could rely on common law powers of the Police to detain and remove people from an area for their own safety, but a State of Emergency is likely to produce much greater levels of compliance and require less use of force. However this does raise the question of whether the RFS should have the power under their own act to ‘force’ evacuations. The traditional paradigm in community response to fires has been to leave it up to the community to decide. Recently we’ve seen a trend towards strongly advising people to evacuate in the worst fires – and an overall preference to evacuation as the safest measure. The State Emergency Service has significant evacuation powers under their Act in the case of flood emergencies, which can even include the use of force. To give the RFS greater powers to evacuate people would give them more options in the event of a fire without needing to resort to a State of Emergency. What is it’s extent? To comply with a direction to undertake safety measures in section 37.
Who Exercises it? : Persons where authorised by the Minister. What is it’s extent? Take possession of and use any property. The property owner may receive but is not entitled to compensation. What is it’s extent? Protected persons (or the Crown) cannot be held liable for actions done in good faith. Who Exercises it? : Any person acting under the execution of a State of Emergency. What is it’s extent? Protected persons (or the Crown) cannot have legal proceedings brought against them for actions done in good faith. The NSW Government has declared a State of Emergency with regard to the bushfires in the Blue Mountains and the forecast deteriorating weather conditions. One of the reasons given for the declaration is the additional evacuation powers this grants the Rural Fire Service (once the actual wording of the declaration is published I’ll be making a post on what exactly are the additional powers it grants). Large areas of the Blue Mountains could come under threat. Though the likelihood of a complete evacuation of the Blue Mountains has been played down the RFS says that it is looking at the planning. So let’s look at the feasibility of a large scale evacuation. I’ll use a back-of-the-envelope version of the evacuation timeline method developed by the NSW SES. NSW does have a plan for a large scale evacuation – in the event of an extreme flood in the Hawkesbury-Nepean River (incidentally this plan also calls for the declaration of a State of Emergency – primarily to convey the seriousness of the situation). If there was to be a whole-scale evacuation of the Blue Mountains I would expect some elements of the evacuation planning around a Hawkesbury-Nepean flood to be utilised. Though the Great Western Highway is mostly double lane, dual carriageway it narrows to a single lane each way in a number of places, notably at Hazelbrook and Woodford. Single traffic lanes can carry 1200-1500 vehicles per hour. Standard practice is to halve this figure to account for emergency conditions, smoke, emergency vehicles, accidents etc. Census figures estimate a total of about 50,000 vehicles owned by households in the Blue Mountains area – experience shows that households will use all available vehicles to evacuate. 50,000 vehicles / 600 vehicles per hour = 83 hours or about 3.5 days. If Wednesday were indeed going to be catastrophic the evacuation would need to start now. Now if you could convince a whole lot of households to leave their cars at home, travel with only what they could carry (both of these are pretty unlikely assumptions) and take the train it might be possible to evacuate all the Blue Mountains in about 6 or 7 hours. Still too long? If it did come to it, an evacuation of the Blue Mountains would be a multi-day round-the-clock operation involving massive coordination of transport assets, traffic control and a huge effort to convince the community of the need to leave very early. It would need to be called long before the fire was directly threatening properties – in the worst case the decision would need to be happening now.